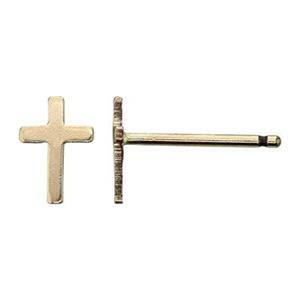 14/20 Gold-Filled 4.3x6.3mm 24 gauge Tiny Cross Post Earring Stud, .7mm Post Thickness. Clutches not included. 10 piece pack is the equivalent of 5 pairs. Not all Superheroes wear capes. Mine wore a cross. Our GF667R – 14/20 Yellow Gold-Filled 24 Gauge Tiny Cross Post Earring Stud. A tiny reminder that it was Love and not nails that kept our Savior on the cross. Please choose from our Gold-Filled Clutches to affix to your Posts.